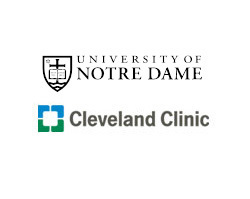 The University of Notre Dame has entered into a collaborative relationship with the Cleveland Clinic for joint development and commercialization of medical innovations. Notre Dame will be the first university within the Cleveland Clinic Healthcare Innovation Alliance network, which includes the largest nonprofit health care system in the mid-Atlantic, MedStar Health and its MedStar Institute for Innovation; and the nation’s second-largest nonprofit, secular health care system, North Shore Long Island Jewish and its Feinstein Institute for Medical Research. Through the Healthcare Innovation Alliance, Notre Dame will have access to Cleveland Clinic Innovations’ comprehensive technology and commercialization services infrastructure. Through streamlined integration of the various capabilities between all Alliance members, there will be a focus on the development and deployment of new medical innovations that are generated by faculty and researchers at Notre Dame. In recent years, Notre Dame has demonstrated its commitment to strengthening its research enterprise by increasing investments in state-of-the-art facilities and infrastructure. While Notre Dame does not have a medical school, the University has grown its funded research program significantly and now secures external funding totaling more than $100 million annually. The University has invested $80 million of internal funding through its Strategic Research Investment program to advance the scope, excellence and visibility of its research and scholarship. With approximately 50 inventor disclosures annually, Notre Dame sees the Healthcare Innovation Alliance network as an opportunity to create a commercialization pathway for innovative technologies in the biotechnology and health science space. Through the distinctive Healthcare Innovation Alliance, Cleveland Clinic Innovations will provide on-the-ground support to assist Notre Dame to advance the creative ideas of its researchers, faculty and staff. Cleveland Clinic Innovations will employ the same knowledge and resources that have helped it create a reputation as an industry leader in navigating the commercialization process, resulting in 48 spin-off companies and more than 300 licensed technologies. Cleveland Clinic is a nonprofit multispecialty academic medical center that integrates clinical and hospital care with research and education. Located in Cleveland, it was founded in 1921 by four renowned physicians with a vision of providing outstanding patient care based upon the principles of cooperation, compassion and innovation. More information is available online at http://www.clevelandclinic.org/innovations. Originally published by Julie Hail Flory at newsinfo.nd.edu on May 17, 2012.